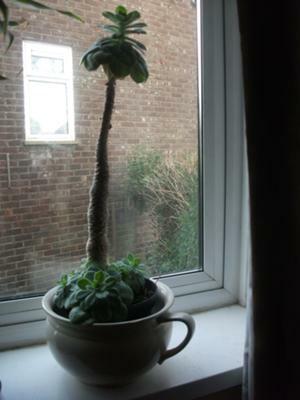 Thin long palm succulent plant on top consisting of rounded leaves with pointed tips, look like a rosette, lots of baby ones at base of plant. Hi Jackie, what you have looks like some type of Aeonium. These interesting and beautiful plants tend to have this growth habit, especially if the light source is not bright enough. Native to the Canary Islands and Tenerife, they have evolved to have a liking for extremely bright conditions, more than they would get beside even a bright window in Wales. This type of growth is easy to deal with; simply behead it! I know it sounds harsh, but honestly, this is the best way to rejuvenate this type of leggy growth. By removing the top rosette, you'll promote buds below that to start growing, and in time, you can have lots of new baby plants to replace the aging rosette. Aeonium are what is known as 'monocarpic' or once flowering, and after the long bloom stalk emerges and the yellow flowers open, that rosette will die. Lucky for you, there are lots of new rosettes at the plants feet to take her place.